The weather is very indecisive in my area these days. Today it looks like a friendly Fall day, but the next day is kinda cold and very close to a winter day. In this situation, I prefer to play it safe and stay somewhere in the middle when it comes to choosing my outfits. Yesterday was one of these days, not too cold but certainly not warm enough, and for the first time this year I was wearing my leather trench. Also for the first time, I wore this red Phillip Lim bag that I am crazy about. It is a mix of old with new, high and low pieces and this is the result. Looking forward to hear your opinion! i am in love with those pants….actually make that the entire look!!! Can’t believe those pants are F21 – love this all neutral palette with the pop of red…gorgeous! Looking gorgeous! Love the pants! It must be so comfy! Stunning, as always. You have a nice body as well. Could you elaborate a post about your daily exercise routine, if any? Thanks in advance! Qué look tan bonito!! Los pantalones son preciosos! What a brilliant outfit! The pop of red goes perfectly against the tan and neutral hues. great look! 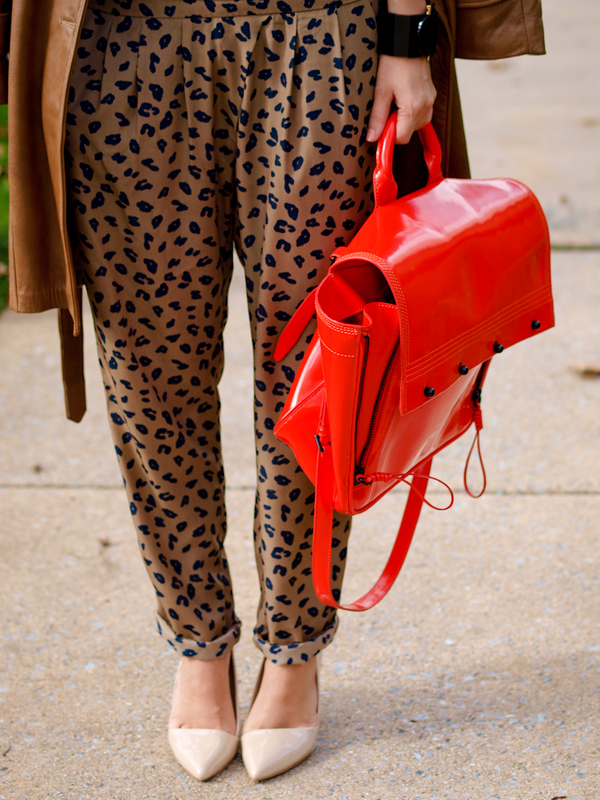 loving the pop of color with this red bag! I love this! I hardly ever carry my red handbag. I’ll have to try this color combo with the red bag soon. It definitely wakes up the black and brown. The weather here in NC doesn’t know what it wants to do either. During the day, its nice and warm but at night it’s cold. I even had to add extra blankets to the bed last night. wow! great Outfit! love this bag! Amazing outfit, colors and pictures!!! I have a crush on you bag! Love this outfit. The pants(the cut) is exactly like some I have and you gave me ideas on how to use it!! !Love the coat and the Bag of course. the Pillip Lim Bag are MY favorites at the moment. U are a lucky and very beautiful girl my dear!!!! sorry but I have to say it.. I am totally in love with you! Such class and pure elegance! Beautiful!